Successfully Added VKWorld 6735x Smartphone - 5 Inch HD Screen, 4G Dual SIM, Android 5.1, OTG, Smart Wake, MTK6735P Quad Core CPU (Black) to your Shopping Cart. If you are looking for an entry-level smartphone that won’t over-burden your budget while offering all the important functionality – take a closer look at the VKworld 6735x. Coming from the well-know smartphone manufacturer, the VKworld 6735x features a 5 inch HD screen, 4G connectivity, Android 5.1 and more. The VKworld 6735x comes with a sleek design and a large 5 inch screen, displaying your content in HD. Great for watching movies, playing games, browsing the web or working with apps, the smartphone’s display will offer you great image quality and vivid color reproduction. The smartphone features Android 5.1 and gives you access to lots of great content. From apps to games, you will find everything you need at the Play Store and the quad core processor will let you work with the newly-acquired tools smoothly, multitask and more. VKworld’s 6735x comes with a nice set of interface shortcuts, letting you get the most out of the phone’s functionality and speed up operation. Smart Wake lets you get to some of the most frequently used apps directly from the locked screen. With Gesture Sensing, a quick wave of your hand can control music playback, switch between applications and more. The quad core smartphone comes with great connectivity and you will have two SIM cards to use it in full. Thanks to the extensive network coverage, including 4G: FDD 800/1800/2100/2600MHz – you are sure to stay well-connected at any time. With the VKworld 6735x, you get up to 8 hours of continuous talk time and 72 hours on standby thanks to the phone’s 3000mAh battery. With USB On-The-Go, you will benefit from easy data exchange with other devices. 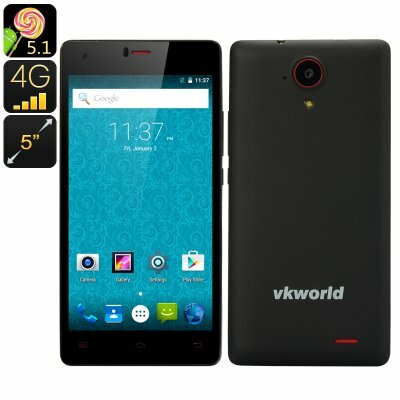 The VKworld 6735x smartphone comes with a 12 months warranty. Brought to you by the leader in electronic devices as well as wholesale Android Phones..